A great opportunity to own an established Urban Bricks Pizza franchise at a GREAT PRICE! Urban Bricks Pizza Franchise Motto: "NEAPOLITAN PIZZA, WITH AN ALL AMERICAN ATTITUDE!" This Urban Bricks Pizza café is well located in a nice strip shopping center near the Texas A&M campus in College Station TX, and it has the 'Classic Neapolitan' design. The lease is transferrable at an attractive rate and there is a tremendous opportunity to grow sales. 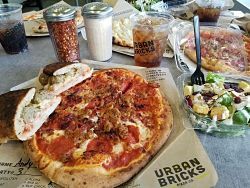 No experience is required to become a Urban Bricks Pizza franchisee as a comprehensive training program and ongoing support at the nearby corporate franchisor headquarters is included. This franchised Pizza business has huge market potential in the booming college town of College Station, TX. - Low cost of entry –> Less than $500,000. - Extreme attention to location selection. - Hands on support from franchisor thru field support personnel. - We consider first time entrepreneurs adaptable concept. - Only fast casual pizza brand that offers delivery, drive thru or full sports bar module. - Proprietary Dough and Sauces made in house, fresh daily. - Rotating ovens provide a more even cook with significant labor savings. • This specific franchise is located in a large, pizza-eating college town near the campus of Texas A&M University. • This franchise receives hands-on support from the close-by corporate franchisor thru field support personnel. 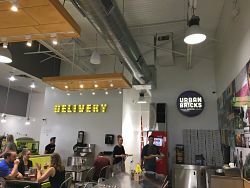 • Urban Bricks Pizza is the only fast casual pizza brand that offers delivery, drive thru, dine-in and/or a full sports bar module for the franchisee. Fast-casual restaurants are the fastest growing segment of the economy. In a busy world, people appreciate the benefits of eating out, and food that’s affordable, healthy, and quick is in high demand. Urban Bricks Pizza delivers on all counts. 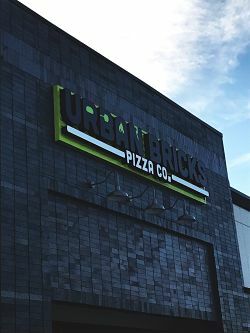 To find out more about this exciting Urban Bricks Pizza franchise for sale, please fill in our request information form.